It is approx. 434 Km, and remains open for traffic from early June to November. The most impressive part of this road journey is the ascent up the 11,500 feet 3,505 m high Zoji-La, the pass in the Great Himalayan Wall that serves as the gateway to Ladakh. The J & K State Road Transport Corporation (J&K SRTC) operates regular Deluxe and Ordinary bus services between Srinagar and Leh on this route with an overnight halt at Kargil. Taxis (cars and jeeps) are also available at Srinagar. Groups can charter Deluxe and A-class buses for Leh, Kargil or Padum (Zangskar) from the J & K SRTC at Srinagar. 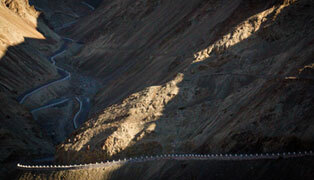 Since 1989, Manali-Leh highway of the 473 km has been serving as the second ways to reach Ladakh. It opens for traffic from around mid-June to early October. This high road traverses the upland desert plateau of Rupsho, altitude ranges from 3,660 m to 4,570 m. A number of high passes fall en route among which the highest one known as Taklang-La is world’s second highest motorable pass at an altitude of 17,469 feet/5,235 m.
Himachal Pradesh Tourism, HRTC and J & K SRTC operate daily Deluxe and ordinary bus services between Manali and Leh. The bus journey between Leh and Manali takes about 19 hours or two days with an overnight halt in camps at Serchu or Pang. Maruti Gypsy and jeep taxis are also available. Leh-Delhi daily flight to and fro. 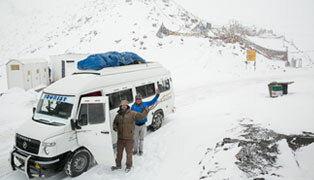 3 days a week Jammu-Leh (Sunday, Monday and Friday) to and fro. Once a week Chandigarh-Leh (Saturaday) to and fro. Summer: Leh-Delhi daily 4 flights to and fro. Leh via Srinagar-Mumbai daily 1 flight to and fro. 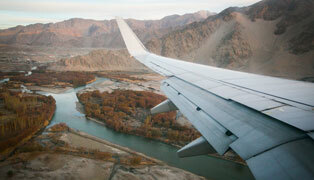 Winter: Leh-Delhi daily 2 flights to and fro. Summer: Leh-Delhi daily flight to and fro. Winter: Leh-Delhi 3 days a week to and fro. A public bus is the cheapest way to travel within the region. The most comfortable and convenient mode of travel is by taxi, which is available for hire on fixed point-to-point tariff. For visits to some areas of Nubra, Dah-Hanu, Tsomoriri, Tsokar and Pangong Lake, it is mandatory to engage the services of a registered/recognized travel agency for making all the requisite arrangements including internal transport. Detailed information about bus schedules, taxi tariff, travel agencies can be obtained from the Tourist Office or Local travels guide "Reach Ladakh", available at Book Shops.